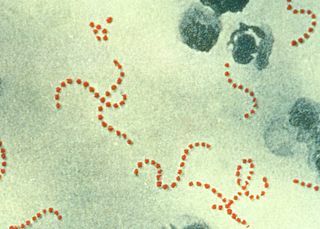 Bordetella pertussis is a Gram-negative, aerobic, pathogenic, encapsulated coccobacillus of the genus Bordetella, and the causative agent of pertussis or whooping cough. 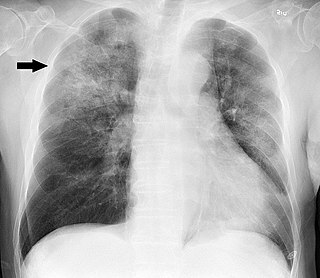 Unlike B. bronchiseptica, B. pertussis is not motile. Its virulence factors include pertussis toxin, filamentous hæmagglutinin, pertactin, fimbria, and tracheal cytotoxin. Bordetella bronchiseptica is a small, Gram-negative, rod-shaped bacterium of the genus Bordetella. It can cause infectious bronchitis in dogs and other animals, but rarely infects humans. Closely related to B. pertussis—the obligate human pathogen that causes pertussis ; B. bronchiseptica can persist in the environment for extended periods. Onchocerca volvulus is a nematode that causes onchocerciasis, and is the second leading cause of blindness worldwide after trachoma. It is one of the twenty neglected tropical diseases listed by the World Health Organization (WHO), with elimination from certain countries expected by 2020. Pertussis toxin (PT) is a protein-based AB5-type exotoxin produced by the bacterium Bordetella pertussis, which causes whooping cough. PT is involved in the colonization of the respiratory tract and the establishment of infection. Research suggests PT may have a therapeutic role in treating a number of common human ailments, including hypertension, viral infection, and autoimmunity. 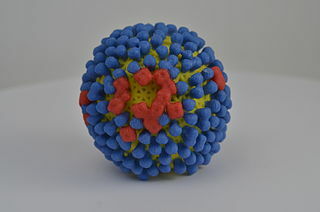 Influenza C virus is the species in the genus Influenzavirus C in the virus family Orthomyxoviridae, which like other influenza viruses, causes influenza. Mycoplasma ovipneumoniae is a species of Mycoplasma bacteria that most commonly inhabits and affects ovine animals. M. ovipneumoniae is a respiratory pathogen of domestic sheep, domestic goats, bighorn sheep, mountain goats, and other caprinae that can both cause primary atypical pneumonia and also predispose infected animals to secondary pneumonia with other agents, including Mannheimia haemolytica. 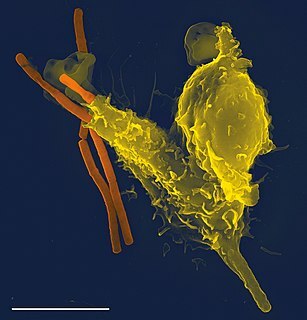 Several mechanisms are involved in the pathogenicity of M. ovipneumoniae, including altering macrophage activity, adhering to the ruminants' ciliated epithelium via its polysaccharide capsule, inducing the production of autoantibodies to cilary antigens, and suppressive activity on lymphocytes, all of which are important factors that contribute to the disease in sheep and other small ruminants. The bacterium also has the ability to act as a prediposing factor for other bacterial and viral infections. Tracheal cytotoxin (TCT) is a 921 dalton glycopeptide released by Bordetella pertussis and Neisseria gonorrhoeae. Influenza D virus is a species in the virus genus Influenzavirus D in the family Orthomyxoviridae, that causes influenza. ↑ Ryan KJ; Ray CG, eds. (2004). Sherris Medical Microbiology (4th ed.). McGraw Hill. ISBN 978-0-8385-8529-0. ↑ Heininger U, Stehr K, Schmitt-Grohé S, Lorenz C, Rost R, Christenson P, Uberall M, Cherry J (1994). "Clinical characteristics of illness caused by Bordetella parapertussis compared with illness caused by Bordetella pertussis". Pediatr Infect Dis J. 13 (4): 306–9. doi:10.1097/00006454-199404000-00011. PMID 8036048. ↑ Wolfe D, Goebel E, Bjornstad O, Restif O, Harvil E (2007). "The O Antigen Enables Bordetella parapertussis To Avoid Bordetella pertussis-Induced Immunity". Infection and Immunity. 75 (10): 4972–9. doi:10.1128/IAI.00763-07. PMC 2044517 . PMID 17698566. ↑ Cherry J (1996). 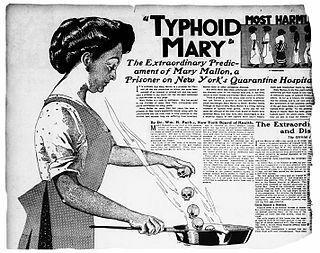 "Historical review of pertussis and the classical vaccine". J Infect Dis. 174 Suppl 3: S259–63. doi:10.1093/infdis/174.supplement_3.s259. PMID 8896526. ↑ Porter J, Connor K, Donachie W (1994). "Isolation and characterization of Bordetella parapertussis-like bacteria from ovine lungs". Microbiology. 140 (2): 255–61. doi:10.1099/13500872-140-2-255. PMID 8180690. ↑ van der Zee A, Mooi F, Van Embden J, Musser J (1997). "Molecular evolution and host adaptation of Bordetella spp. : phylogenetic analysis using multilocus enzyme electrophoresis and typing with three insertion sequences". J Bacteriol. 179 (21): 6609–17. doi:10.1128/jb.179.21.6609-6617.1997. PMC 179586 . PMID 9352907. ↑ Porter J, Connor K, Krueger N, Hodgson J, Donachie W (1995). "Predisposition of specific pathogen-free lambs to Pasteurella haemolytica pneumonia by Bordetella parapertussis infection". J Comp Pathol. 112 (4): 381–9. doi:10.1016/S0021-9975(05)80019-2. PMID 7593760.